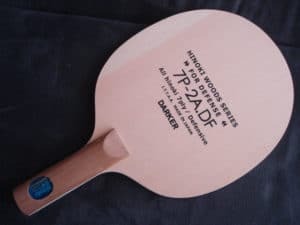 Unfortunately Butterfly Japan has announced that the famous modern defender blade, the Butterfly Joo SaeHyuk blade, has been discontinued, presumably since Joo retired in 2018. Although Butterfly may come up with an alternative or re-release it under a different name (they’ve done this before), there is no news on this as yet. So for modern defenders that would like to play a style similar to Joo (who wouldn’t! ), what are the best alternatives? The Joo SaeHyuk blade (also known as the Joo Se Hyuk blade) is the blade used by Joo SaeHyuk himself, and it’s always been a popular choice for modern defenders. The blade has a fairly hard feel, is relatively thick and stiff, and rated around OFF, which is quite fast for a defensive-style blade. The heavy weight was always an issue for some players, although some players seem to like it. Joo himself used to use it with Butterfly Tenergy 64 on the forehand, and TSP Curl P-1r long pimples on the forehand (although he’s used a few other rubbers on occasions, this seemed to be his common choice). Below is a picture of the blade in it’s latest release, followed by the manufacturer description. Perfect for defense as well as quick counter-spins far from the table. The enlarged head of the blade provides the necessary control for chopping and blocking. The Joo Saehyuk is first choice for defenders who rely on heavy spin combined with fast topspins due to the hard feel. OOAK Shop is a Butterfly distributor, and as soon as we discovered that the Joo SaeHyuk blade was discontinued, we stocked up just in case some players are keen to get one before they’re gone. As we specialise in defensive equipment, we also have a few alternatives, which is just as good in their own right, and may offer some properties that make them preferable, like lighter weight. Compared to the Joo SaeHyuk blade, the Darker 7P-2A.DF is virtually identical in size, but a step slower with a softer feel. It’s also considerably lighter, weighing around 85g. Although this blade doesn’t quite have the kill power of the Joo SaeHyuk blade, it’s considerably easier to control, and is a little more spin and control focused. In terms of quality, Darker is premium quality, certainly as good as the Butterfly blade, and the blades are made in Japan. The Yuto Muramatsu is also almost identical in shape and size, and also a step slower compared to the Joo SaeHyuk blade, slightly slower than the Darker, but a similar hard feel. This one also considerably lighter, weighing around 90g. Although this blade doesn’t quite have the kill power of the Joo SaeHyuk blade, it’s considerably easier to control, and is a little more spin and control focused. In terms of quality, Victas is premium quality, certainly as good as the Butterfly blade, and the blades are made in Japan. Victas specialise in Defensive equipment, no doubt due to the influence of Koji Matsushita, one of the best defensive players ever. The Victas Koji Matsushita Offensive, and the Koji Matsushita Special would also be suitable options. Here is a tribute to the great Joo SaeHyuk, arguably the greatest modern defender of all time! ← Edge Tape for Table Tennis Bats – who needs it and which are best? 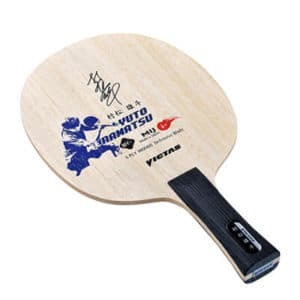 What does “ITTF Approved” mean? 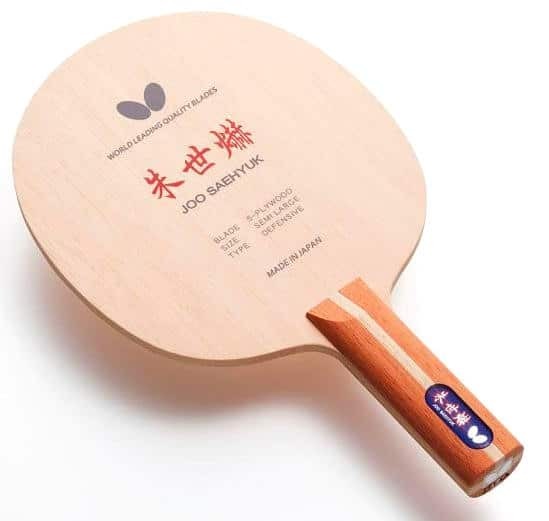 Butterfly table tennis equipment – OOAK Shop’s extended range! Adam zito on Victas Sponsorship Offer – players apply now!